Some years ago, dearest Mildred, my memory records that you made me promise that if ever I came across any enamel of the kind represented by Stoclet’s little roundels,These enamels were acquired by Adolphe Stoclet from the Istanbul antiquities dealer Andronikos. See letters of April 29, 1928; May 10, 1928; September 12, 1928; and October 23, 1929. I’d let you know at once. Well, MalyeThérèse Malye (1886–1951), Mildred Barnes Bliss’s social secretary in Paris. is sending you, today, a photo, of the best one I’ve ever seen—better than the celebrated Castellani brooch in the Brit. Mus.Alessandro Castellani (1823–1883), an Italian jeweler and antiquities collector who had businesses in Paris, London, and Naples. The Castellani Brooch, Lombardic (? 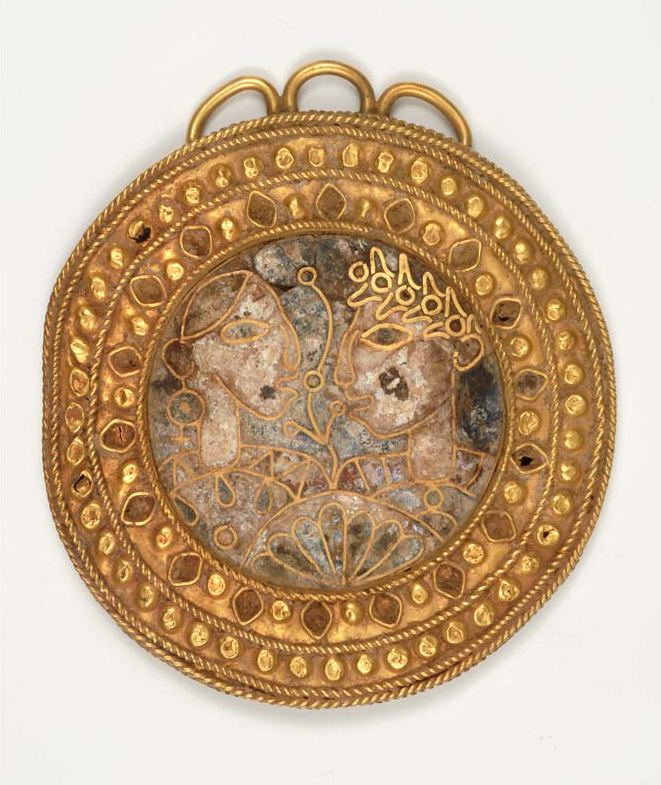 ), seventh–ninth century, gold and enamel, was acquired by the British Museum, London, from Castellani in 1865 (1865,0712.1). The brooch is in the form of a gold disc with a central roundel of cloisonné enamel representing a bust and with stylized cypress trees on each side. Around this is a border of cloisonné enamel flanked on either side by a circle of small rings with pearls between them. On the lower sides are three loops for pendants. The photo, doesn’t give at all an adequate idea of it, but it was all I could get. It is of the exact size of the object. The gold frame comes out particularly badly. The enamelSee The Dark Ages: Loan Exhibition of Pagan and Christian Art in the Latin West and Byzantine East (Worcester, Mass., 1937), 42, cat. no. 122. Marvin C. Ross doubted its authenticity in “Letter to the Editor of the Art Bulletin,” 33, no. 1 (March 1951): 72. belongs to Sangiorgi of Rome, who sent a man with it specially here last week to show it to Hayford and me. The man of course only stayed an hour or so, and the enamel has now gone back to Italy. We had a very good look at it, and noted the colours, as you’ll see on the back. It appears it was found at Benevento, and that fits in well with the style, which is VII–VIII cent., Longobard strongly influenced by Byz. like the Castellani brooch (and the Stoclet roundels). The enamel is slightly iridesced. When one moistens the surface, the colours come out wonderfully. The gold is lovely. Sangiorgi wants Lire 125,000. (about £ 2,000 at pres. rates) for it. He might take less. He’s a very big dealer, as you know, and I believe rich in spite of the crisis. I don’t consider the price an excessive one, even at the present moment. I’ve just returned from London, where I saw the V and A’s latest acquisition, the celebrated ivory situla, or holy-water bucket, from the Ermitage,Situla, ca. 980, ivory, Victoria and Albert Museum, London, A.18-1933. The Victoria and Albert Museum acquired the situla in 1933 from the Soviet government through the dealer Durlacher & Company for £7,900. for which they have just paid £7,500. I think they were right to get it, though they had to blow in all their little economies. Robert is here, under this very roof. I took him yesterday and carried him off with me. He is so sweet and dear, bless him, and so comfy. I went to London to make a circumstantial call on Bill’s prospective mother-in-law,Mrs. Laurence Fisher-Rowe. who—well, a mother-in-law. The girl,Bettine “Betsy” Fisher-Rowe Tyler. whom I have known for a couple of years, is a very good specimen indeed, really not the sort of object such a young collector usually succeeds in acquiring. Much love from Elisina and Bill. Bless you, my precious one.